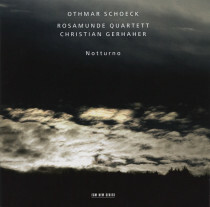 Swiss composer Othmar Schoeck wrote his five-movement Notturno, Op. 47, between 1931 and 1933 for low voice and string quartet. Texts are by Gottfried Keller and Nikolaus Lenau.